The eight-week beginners course encompasses all the basics of fencing. From the typical en-guarde position, to cunning attacks and ripostes, you’ll be given the foundations of a sword fighter. Beginners are taught by coach Paul Willmott, who has been an active competitive fencer for over fifteen years and teaching newcomers to the sport for a decade. Assisting him to demonstrate and pass on the moves are the club’s best fencers. The first session is a condensed introduction to fencing, aiming to get newcomers kitted-up, armed, and hitting each other with weapons as quickly as possible. The safety requirements will be explained and the weapons you will be using will be introduced. Then after being taught the en-guarde stance, basic footwork, simple attacks and defences, the fighting begins! At the end of the session, you will be invited to the rest of the course, and should you wish to go for it you’ll meet the club Treasurer to arrange payments for the course. This week, after a review of safety regulations and moving forwards and backwards holding a foil, you will be shown: the salute, how to attack and score a hit with a lunge, the “fencing line”, and the “lunging distance”. Building on from last week, the lunge will be worked on along with the ability to move into the right distance to lunge. Doing this well gives a fencer the advantage of being able to launch an attack without fear of being hit themselves. The emphasis falls heavily on being able to use footwork and movement to get into the best position to score hits. Too close and you might get hit pre-emptively. Attack from too far away and your opponent can defend easily. This is where the brainwork comes in. Now a focus on bladework: here you will learn the beat-attack, a short and sharp strike on your opponent’s blade to deflect it out of the way as preparation for an attack straight after. Then we go from offensive bladework to the defensive, introducing the parry. This week you will learn the parry of quarte (the 4th parry), the most simple of defences in fencing. You will learn how to do this in response to your partner lunging at you, and stop their attack dead in its tracks. Carrying on with the defensive theme of last week, after reviewing your parry quarte you’ll be taught parry sixte (the 6th parry). Then we return to attacking moves, with the explosive step-lunge, before coming full circle with how to hit after making a parry (a “riposte”), and doing this with movement. *retreat= ideally a “tactical withdrawal”! By this time you have been given a nicely rounded introduction into the technique of the sport, so after further work on the counter-riposte, along with doing it with movement, you will be introduced to the rules of the bout. This will involve: when to salute your opponent and referee, responding to the referee, the rules of the piste (fencing’s field of play), how points are award, and the duration of fights. You then fence everyone else on the course, putting what you have learnt into practice. You will also have the option to stay until 10pm (8:30pm for juniors) with the rest of the club, taking part in more footwork, challenging other members to fights, and meeting the rest of the club. The rules of the bout are reviewed and a mini-competition takes place. It’s an opportunity to put all you have learnt into practice in a friendly environment where you get the complete feeling of what modern fencing is all about. No coaching this night, it’s all about trying to score hits against the fencer in front of you! Once the dust settles, you will be invited to stay on for the rest of the evening and to join the club as a full member. Should you wish to join the club as a full member at the conclusion of the course, you will be given many opportunities to go further in the sport in one of the UK’s friendliest and best-equipped fencing clubs. Juniors (under-16s) fence from 7pm-8:30pm on Thursdays, led by our coaches Rob May, Graham Beech, Jamie McClement, and Stephen Conroy. Here young fencers train together in a fun and friendly learning environment. Some sessions are focussed on serious technical/tactical development, while some sessions are more laid-back and chilled out, because sometime we just want to suit up and fence! From 8pm, the adults (16yrs+) session begins. We have a variety of coaches available for one-to-one lessons and group training, all you do is ask them nicely! Otherwise, just pick a weapon up and challenge someone to a bout: your coach is a great teacher, but experience is even better. The more fights you have, the more you learn and improve. Twice a month we are treated to a guest-coach appearance by England coach Jonathan Katz, who oversaw the English fencing squad to gold medal success at the 2014 Commonwealth Fencing Championships. Members are encouraged to buy their own fencing clothing and equipment, and to take part in the club’s many local competitions. These are friendly events aimed at giving members a taste of competitive fencing, and some are to raise money for various charities in honour of past members. Members are also encouraged to compete on the national circuit. We’ll let you know about tournaments up and down the country, prepare you for them and give you as much support as possible. We have a sizeable group of travelling fencers who do these national-level events, all who will happily back you all the way. The club has also in the past funded or part-funded its members to go on coaching and refereeing courses. Courses like these help the club and help those doing them expand their own knowledge and understanding of the sport. 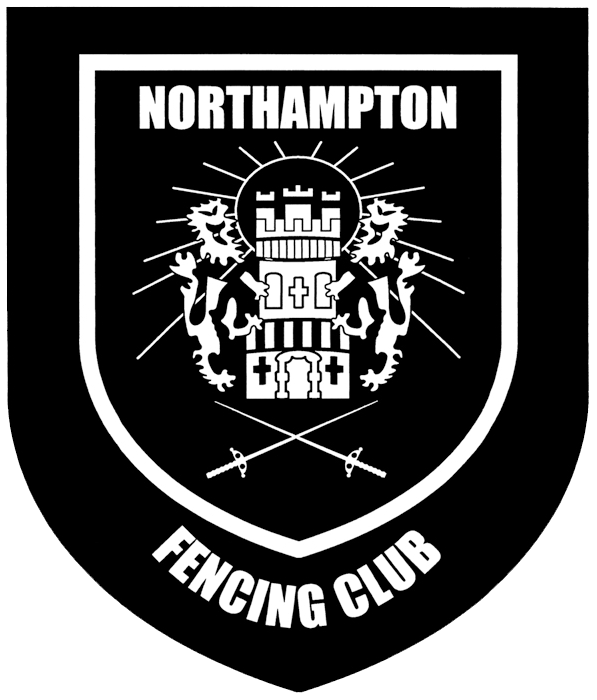 Fencing is very much a minority sport in the UK, but Northampton Fencing Club’s Committee, coaches, general members and friends will look to give you every opportunity to enjoy this uniquely wonderful sport.